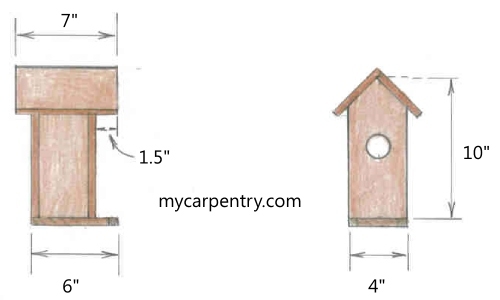 Free birdhouse plans - this plan is called the Tall Texan because of its height, and because its roof is painted similar to a Texas flag. Of course, you don't have to paint this birdhouse at all. Old fence boards have a great natural look. This birdhouse can be built from a single 6 foot 1-inch x 4-inch fence board. Most of my birdhouse projects are built from used fence boards. If you do the same, the material is free. The only cost was the galvanized air nails that I used to fasten the pieces together and the wire I used to hang it. Using the diagrams below as a guide, you can get an idea of how the pieces fit together. The two side pieces are 8 inches in length. The two end pieces are 10 inches in length, and the angle of the roof is 45 degrees. 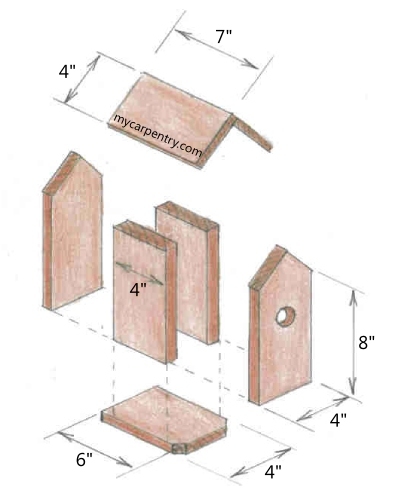 To cut the end pieces, measure 8 inches from both sides and cut a 45 degree angle on each side to form the roof slope. Attach the two end pieces to the two side pieces keeping the bottoms flush, as shown below. Attach the bottom piece and roof pieces together, using galvanized finish nails or screws (as shown in the diagram below). This birdhouse is perfect for Chickadees, Titmice, and Wrens, but other small birds might find this bird house suitable for nesting. The last bird I saw accessing this bird house was a Carolina Wren. 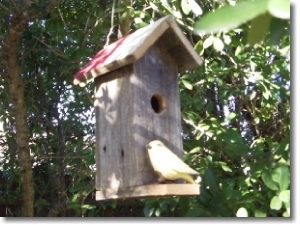 Building birdhouses, and observing the birds that nest in them, is an excellent way to learn about birds and their behavior and habitat. We enjoy birding wherever we go, whether it be an RV Trip, or just a short trip to the market. Not long ago, while sitting in my pickup-truck waiting for my wife to come out of the grocery store, my nephew and I spotted a female Scott's Oriole in one of the small trees in the parking lot. I had never seen one in the area where we live. You never know when and where you are going to spot that rare bird!